Ho, Launchies! It’s been months and months since we’ve podcasted and Kelly and I finally got off our lazy butts to record a new episode for you all to listen to! In Episode 36, we talk about DVD sales, whether or not we think they’ll make more movies (and why they should) and also catch up on some of the cast members’ latest projects. I think I used this same image for a previous episode, but since it fits the title best, I like it anyway. Sound off in the comments and let us know what you think of the episode. We give automatic kudos for anyone who finishes the whole thing. 🙂 I imagine any of the Battle School names are fair game too. —–It was exciting becoming part of a community with a shared interest. 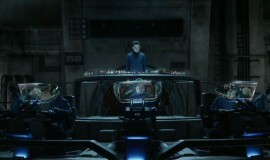 I was fortunate to go to the Ender’s Game Experience at ComicCon. My wife and I drove down to San Diego, parked in Old Town, rode the train to the convention Center. It was fun seeing movie props and saying ‘hello’ to you (Crystal) and Kelly. —–I got almost every one to read the book before the movie came out. Though, not many went to see the movie. I had some comments regarding the movie; it was too fast, it jumped too quickly from scene to scene, it this … , it that … I now own the DVD and have watched it numerous times. And now, I do not see those things anymore. —–If I had a chance to send a msg to the director, I simply want to say ‘thank you’. We (the EG community) emphatically emphasized our desire to preserve the story as much as possible. And Gavin on many occasions stated that it was his intention to preserve the story. Well, we got what we asked for. And perhaps getting what we wanted ended up making the movie unattractive to the average person. I really think the movie was made for ‘us’ and we are extremely fortunate the story we love was thus rendered the way it is. —–It appears the movie just about broke even. Not a huge argument for a movie studio to create a sequel. So, this is probably it for awhile.